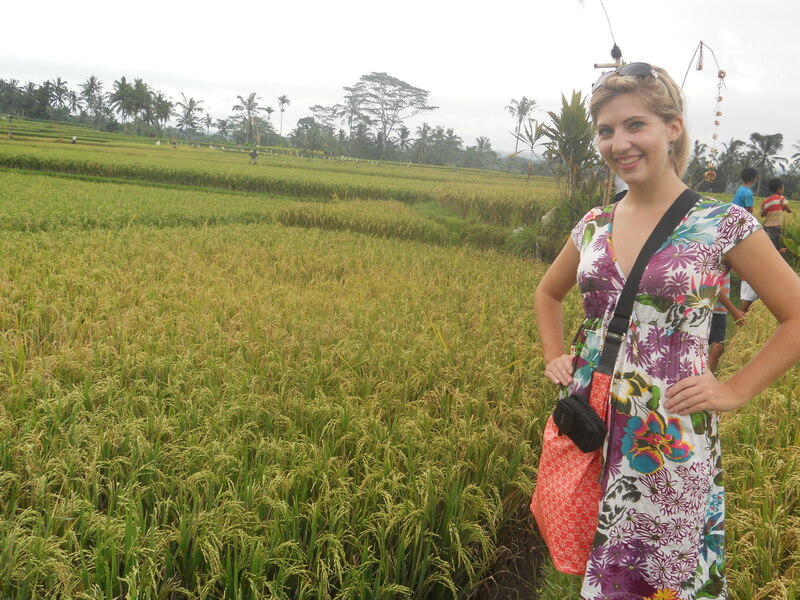 The rest of our time in Ubud was really nice. As Bali’s culture “capital,” Ubud is the place people go to learn about Balinese art, dance, traditions, yoga etc. (as opposed to surfing and partying). As Bali’s other tourist hotspot, it is also full of really cute boutiques and restaurants, and it seems everyone is willing to drive you somewhere or give you a massage. We ended up selecting a dance hall near our homestay, and honestly, I cannot tell you which “level” of dance troupe we saw. To their credit, the setting was amazing. Located behind a lily-pad covered moat with a gold, regal-like backdrop, the open-air stage had a magical, enchanting feel to it. The dancers themselves were absolutely beautiful as well with exotic, colorful costumes and make-up. The performance also had on-stage musicians who play these unique gong and xylophone-like instruments, which is pretty cool to see. The dance itself, however, was, in a word, unique… It is made up with a series of precise hand, arm, head and hip movements with a lot of bent-angle aesthetics that are often used to tell a story. What I found particularly interesting is that they actually use their eyes to dance by opening them wide and looking right to left to the music. It’s quite fun to watch, though slightly creepy…After watching the same few movements over and over and over again, however, it gets a bit redundant and I wouldn’t exactly describe much of the activity as anything that would require you to break into a sweat…Still an interesting experience though. In addition to Balinese dancing, we also had the chance to explore some more local culture in Ubud with a half-day bike tour through the outside villages. What was great about the tour was that you get outside the tourist zones and get to cruise down the hillside (yes, all downhill! ), past the rice paddies, past the women carrying baskets on their heads, and past all the local communities. We made several stops along the way to explore on foot, and I must admit, it was really cool to see what rice paddy looked like. Turns out, it looks kind of like wheat or any other grain, who knew? One of the coolest parts of the trip, however, was our visit to the coffee plantation at the beginning. We got to check out where they grow coffee, vanilla, cinnamon and cocoa before sitting down to sample a few brews :). What was especially interesting, however, is that we got to try civet coffee, or what I prefer to call, “luwak-poo” coffee. For this delicacy, a weasel-like animal called a luwak first eats the berry surrounding the coffee bean, then poos it out. These beans are then roasted and made into a very expensive coffee. There seem to be several theories on why this coffee is so special. Some say enzymes in the luwak’s stomach changes the flavor of the coffee, while others say luwaks naturally choose the best berries, and therefore, the best beans in the wild and make the coffee roaster’s job easier. Either way, the coffee was good, strong, though I’m not enough of a coffee connoisseur to appreciate all its unique flavor :).